Chicago is known for its storied sports franchises, deep-dish pizza pies, and bone chilling wind. 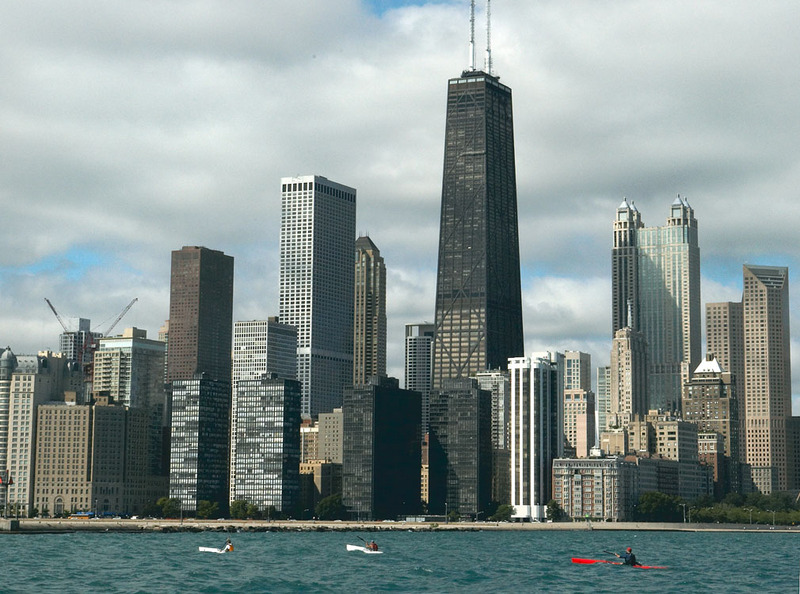 This August, however, the city and Lake Michigan play host to the fourth annual Chicago Shoreline Marathon. The event proudly claims to be “The only world-class race to paddle Lake Michigan and the shores of Chicago”. As a former event participant stated: “I, for one, had no idea of Chicago’s fantastic shoreline, specifically the beaches – I’m glad I made the trip from Minnesota, it was worth every mile of the drive. The CSM is a world class race and a fantastic addition to the open water racing scene”. Though the 25-mile marathon race and crown jewel event of the weekend is designed with the skilled competitive paddler in mind, there are plenty of events for all skill levels. The 4X 4-mile Relay is the ideal race for Club or Corporate teams and adventure racers. Each team will have four paddlers and each paddler will complete one 4-mile leg of the race. This 4-leg relay will start on Leone Beach. Each participant will go south two miles, around a marker, then return to Leone where they switch paddlers for the second leg and so on. The 8-mile 2-beach Race is for more competitive intermediate paddlers. The 2-Beach Course will start on Leone Beach and will consist of one round trip between Leone and Montrose Beaches. The 8-mile round trip will finish back at Leone Beach. The big daddy 25-mile marathon will start at Calumet Harbor on the far south side of Chicago and run north to Leone Beach (Touhy Avenue) on the north side. Marathon contestants will be required to check in at 63rd Street, 12th Street, North Avenue and Montrose Avenue Beaches. The CSM is also proud to also support US TOO – Prostate Cancer Education & Support and provides a venue for the Chicago Adventure Therapy organization to also offer a therapeutic outdoor programs for at-risk youth. All events are open to all lake-worthy human-powered watercraft. This includes surf skis, sea kayaks, outrigger canoes and stand-up paddleboards. Classes will be offered for any craft with 3+ entrants. 1pm-5pm – Clinics with Dawid Mocke, a leading international paddler. Come out early and try out the best and newest in kayaks, surfskis, paddles and paddleboards. Reps will be on-hand to answer all your questions. Competitor boats may be stored (no racks provided). Security will be on duty all night. Beachfront BBQ Dinner is $5.00/person. Meeting to follow will include marathon course review. Competitors meet at Leone Beach. Paddlers and boats will be shuttled to start line at Calumet. PLEASE ARRIVE EARLY TO LOAD AND BE READY TO LEAVE LEONE BY 7AM. Starting at the South Side of Chicago, this course consists of five paddling stretches – paddlers are required to land and check-in at each beach. The CSM Relay starts at 10:00 a.m. from Leone Beach, consists of 4-legs, 4 miles each, for a total of 16 miles. Each team participant will paddle two miles south around a control buoy then returns to Leone Beach. The combined total time will determine the winning team. There will be a post-race party/dinner at Leone Beach. Cost to entrants and guest will be free. Meal will likely start at 3pm and run through the awards ceremony. This is great opportunity to catch up with long lost friends and make plans to paddle Chicago again with new ones! Please plan on joining us for a fun-filled evening before heading home. Awards ceremony will occur at appox. 4:30pm. Door Prizes and raffle items will also be awarded. In the event of race cancellation, Friday and Saturday parties will go ahead as planned! Ed Note: Chicago is a favorite travel destination of mine and I couldn’t pass up the opportunity to share two of my favorite Chicago eateries with the PL faithful. Smoque BBQ on N. Pulaski. Chicago isn’t Memphis or Kansas City, and it’s certainly not Texas, but don’t let that fool you. This is some of the best BBQ I’ve ever eaten. Hot Doug’s Encased Meat Emporium on N. California. Chicago is famous for Chicago Dogs and Sausages, but Doug takes it to a whole other level.